News | Make an Impact with Chief On-Wall Kiosks | Chief | ESA Communications Ltd.
Chief, an industry leader in AV mounting solutions, is bringing a new level of flexibility to digital signage enclosure market. The Impact™ On-Wall Kiosk maintains a sleek aesthetic to complement a variety of environments. A 3-5” (76-127 mm) depth-adjustable exterior frame allows for a variety of display sizes. Reversible hinges help to avoid installation and service obstructions, and our exclusive design keeps the display mounted to the frame when opened, providing unparalleled service and maintenance access. An integrated wall reveal compensates for uneven walls to keep the frame plumb and provide passive cooling. 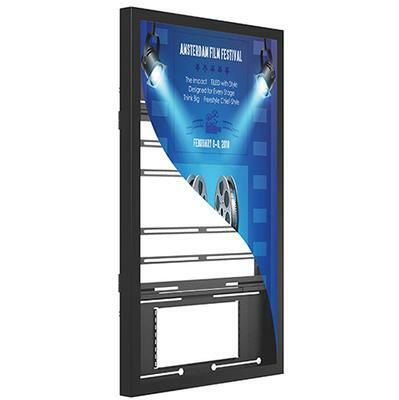 The on-wall kiosk will be available in black or white finishes for 46-75” screen sizes; 49”, 50” and 55” models are available now and the remaining sizes in the series will be released throughout the remainder of the year. Integrated engagement latches can be secured with tamperproof hardware to protect equipment. Middle Atlantic’s Lever Lock™ technology is integrated for on-wall component storage. Additional storage can be added either on-wall with Lever Lock, or in-wall with Chief In-Wall Storage Boxes.